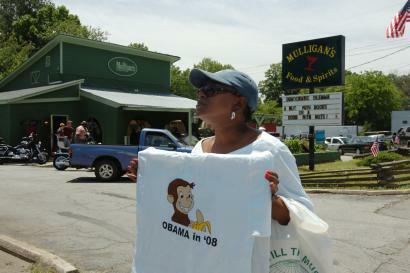 This stupid T-shirt showing Obama as Curious George got a lot of excited coverage. It’s so 19th century. After Charles Darwin’s “On the Origin of the Species” was published in 1859, racists looking for the “missing link” between man and monkey settled on blacks. No human rights for slaves and ex-slaves, then. I’m amazed that even today a t-shirt can hit on that old chestnut. Hey, are people really still that primitive? Actually, Curious George keeps getting used for political cartoons, and not just by racists: George W. Bush has been featured as Curious George, too.